In chapter six of Prophecies and Penalties, “Going among the Children,” Emily Fisher returns to the religious communities that she left with her family twenty years ago. Emily’s not exactly looking forward to this, since she’s on a murder investigation, and doesn’t want the Children to try to reclaim her. But what do the Children of the New Revelation think of Emily? Read the chapter and find out! Yesterday was the official beginning of spring, the Vernal Equinox. In Cambridge, Massachusetts, where I live, it came in classic style, which is to say when the city looks at its worst. The trees are bare, except for a few straggling brown leaves. Small piles of dirty snow survive in shaded areas and where it had been piled up months ago. The lawns could use a good raking to get them ready for spring. And the street sweepers haven’t been on duty since December, so the detritus of a season hugs the sidewalk curbs. Oh, there’s a little bit of color. 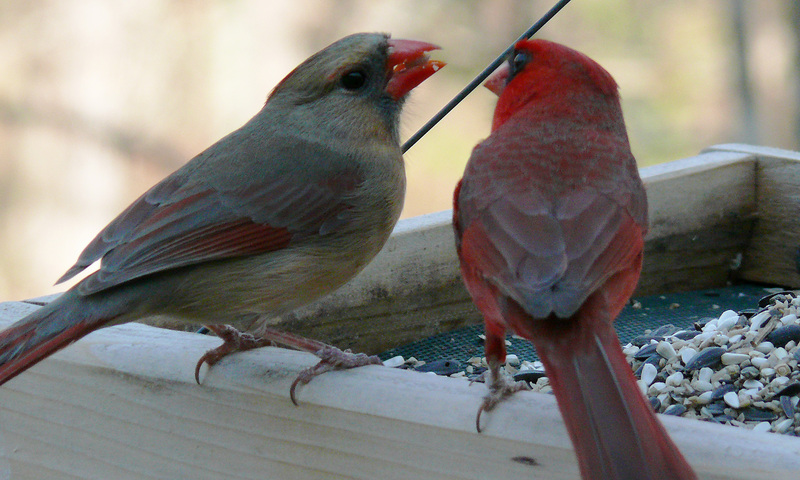 I saw two female cardinals courting a male. And the neighbor’s orange-and-white tom cat, a big fellow, was walking on a neighbor’s roof. That was a bit of a surprise; I have to wonder just how he got up there. But better days are coming. In a month, the trees will be in bloom, and Cambridge will look at its best. I can wait. This entry was posted in Prophecies and Penalties, Writing fiction and tagged detective story, Fiction, murder mystery, Spring, Writing. Bookmark the permalink. Picture caption: Female cardinal, singular. I was debating between community and communities, because there is more than one village of the Children, as you’ll learn in detail in 2 weeks. Sounds like next month will have some nice walks through the neighborhood. I think I’ll get out my camera, just to show how nice it can look. Judging from the pictures, that is a strange looking bird!